Finding the right place to relax and enjoy yourself is not always an easy task; factors such as the availability of flights, the cost of seasonal air tickets or even the climate in the chosen destination usually have an effect on the traveller’s decision. Although some of these things are often determining factors when making the best decision, beach destinations, normally described as paradisiac, are usually the best alternative taking into account cost, availability and climate. The United States is not the exception to this rule and due to the fact that it is so easy for travellers from all around the world and especially countries like Australia, where you just need to request the electronic travel authorisation ESTA Visa, to visit its beaches, it is becoming more attractive and interesting for a large number of travellers. Not sure if your passport is eligible for applying for ESTA Authorization? Check here for all the requirements. This natural park located on St. George Island in the state of Florida, is a forest reserve where visitors can birdwatch and fish, among other activities. Its crystal-clear waters and white sand invite you to enjoy the natural landscape offered to those who return year after year. This beach is located in Massachusetts (east coast of the United States) in a protected forest reserve in Cape Cabo Cod. It is a quiet beach which gives travellers the perfect opportunity to enjoy the sun and the sea breeze, while they contemplate the scenery and the flight of the birds. If you are into ecotourism and you like to study nature by getting close to the smell of the sea and the earth on the beach, this the perfect destination for you. Barefoot Beach Preserve County Park is located in the southwest of the state of Florida. A large variety of marine turtles go to this park to seek refuge for nesting and breeding. Little turtles which, after a while, will try to return to their natural habitat, the sea. It is a lovely place, with friendly people and businesses offering all kinds of food and seafood. Read more: Get to know the United States through its music! If you like water sports like surfing and kitesurfing, this is the best beach for you. 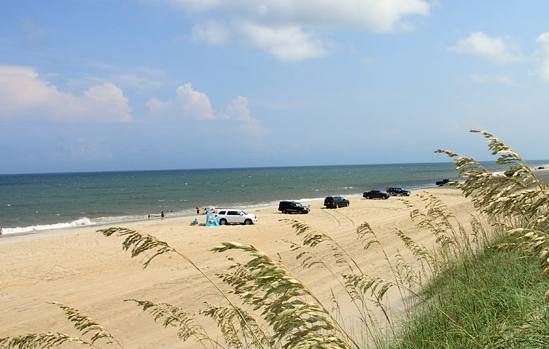 It is located on Hatteras Island, in the state of North Carolina on the east coast of the United States. One of the attractions of this fishing village is that their friendliness allows visitors to have greater contact with this place taking part in activities such as fishing. For this reason, many travellers opt for this magical and captivating destination. This great destination is located in the state of California, on the west coast of the United States. It is the perfect destination to visit with family or friends, with loads of different activities available. East Beach is a dream destination which offers beach games, water sports, ecotourism and a great variety of cuisine. It is a place where people want to return to due to the great experiences they enjoy there. In terms of scenery, this is a simple beach full of palm and coconut trees giving those who visit a unique feeling of pleasure and relaxation. Beachwalker Park is a combination of river and sea in just one place, which is difficult to find anywhere else in the world. Beachwalker is located on Kiawah Island in the state of South Carolina. It is a natural park between the Atlantic Ocean and the Bohicket River, where you will want walk and run from one end to another, while listening to the waves in the sea and the noise of the trees swaying in the breeze while the sun sets. As the Park is unspoiled, far from the hustle and bustle and chaos of the big cities, it is the perfect place for relaxation, rest and meditation for many people who choose this as their holiday destination.